If you need to clean interior tiles in the bathroom, kitchen or other residential living areas, commercial tiled floors or external tiles, MRC Property Services specialises in tile and grout cleaning to keep your tiled areas looking brand new, and free from mould, dirt and lime scale. Wet tiled areas are prone to build up of mould which can spread to an unsightly mess if left uncleaned for long periods of time. Regular tile and grout cleaning with the right products prevents this dirt build-up and enables your tiles to be appreciated and remain mould and dirt-free for longer. 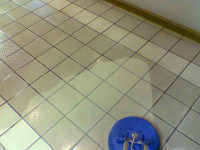 Large tiled floor areas can become very hard to clean from dirt build-up after prolonged usage. Slate, marble, terracotta, stone, and porcelain tiles can be kept clean with our special cleaning machines and products. Porous tiles like Terracotta require sealing regularly (every 2 years) to lock in their beauty and prevent damage, fading and signs of wear. 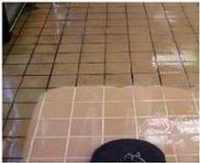 MRC Property Services can provide a quality sealing and tile cleaning service with our high tech cleaning systems, to keep your tiles looking spotless and hygienic. Our powerful, high speed Polivac polishing machine / vacuum cleaner will keep your floor tiles looking polished, clean and spotless. Suitable for all high gloss tiled areas, commercial or domestic, the Polivac suction polisher will transform your tiles and make them shine like brand new.